Border Patrol agents patrolling Interstate 15 stopped an SUV on Sunday filled with $400,700 worth of cocaine and heroin. At approximately 11:15 a.m., agents spotted a 2003 Ford Expedition on I-15 near Temecula. The driver began swerving in and out of lanes to escape, and eventually exited the highway at Temecula Parkway, where agents finally stopped him. 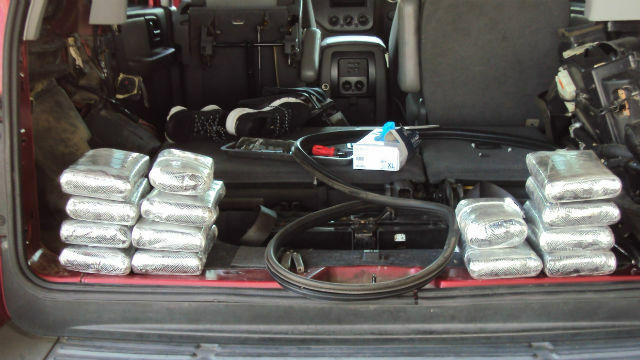 A Border Patrol dog alerted agents to the presence of drugs, and they soon found six bundles of cocaine hidden behind the driver’s side rear-quarter panel. A further search at the Murrieta station revealed eight additional bundles of cocaine and two bundles of black tar heroin. The driver, a 39-year-old U.S. citizen, was arrested and booked into a Riverside County detention center. The vehicle was seized by the Border Patrol. Since Oct. 1, 2018, San Diego Sector agents have seized 865 pounds of cocaine and 2,648 ounces of heroin.